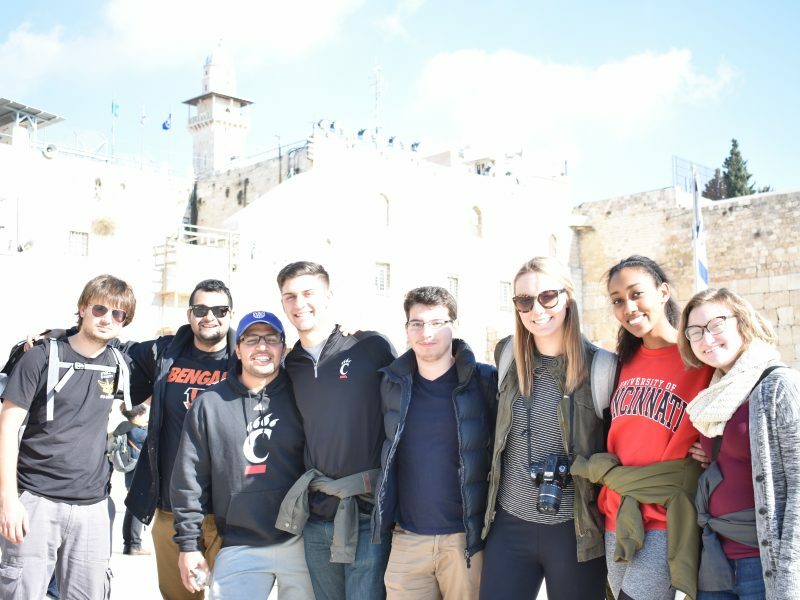 This year’s Cincinnati participants visit Jerusalem on the David Project’s Israel Uncovered trip. Between my sophomore and junior year of college, I was lucky enough to spend the summer in my favorite place on earth (bet you can’t guess where that is ;-)). It was magical. Between my beautiful apartment just a few minutes from the beach and the incredible group of people I lived with, I could not have asked for a better second Israel experience than the one I had through the Onward Israel internship program. The trip’s effort to immerse its participants in Israeli life is truly one of its best qualities. However, the immersion does not necessarily end when undesirable circumstances occur in the country. It was the summer of 2014, aka Operation Protective Edge, and with the snap of my fingers, I found myself in the middle of a violent conflict I was not prepared to handle. Suddenly, my favorite place in the world became a source of fear and confusion that led me to cut the trip short. Still grieving the loss of my Israeli summer and struggling with my decision to leave early, I soon resumed normal life and moved back to college. Alas, the distress I thought had been left in the Middle East promptly greeted me in rural Ohio when the anti-Israel movement BDS (Boycott, Divest, Sanction), which seeks to delegitimize the State of Israel, was suggested in a video that depicted our student senate president dumping a bucket of fake blood on her head to demonstrate the recent violence in Gaza. Almost overnight, our university fell into disarray, splitting the community in two and tainting yet another one of my favorite places in the world. What could have been a fair expression of political disagreement turned into an aggressive, untrue, unwarranted, and unfair attack on all things Israeli and Israel-affiliated, in effect leaving the Jewish community feeling alienated and afraid. Watching all of this unfold, I often wondered what would happen if these expressive students visited Israel and the West Bank. Perhaps they would come back Zionists or perhaps they would return with a similar anti-Israel sentiment. Whatever the case, they would have seen it from up close and formed their own opinions accordingly. Little did I know that a program like this was already in existence and even had a name, The David Project’s “Israel Uncovered” Campus Leaders Mission. The trip takes students from diverse backgrounds to Israel alongside their Jewish peers in an effort to provide an immersive experience that eliminates space for misconception. Turns out that the Cincinnati Hillel partners with The David Project, and I was lucky enough to interview one of the Jewish participants from this year’s trip, Ryan Kun. What inspired you to go on this particular trip? Well, I guess I wanted to see a new perspective of Israel. One that’s different from what we often get on other trips or in the States. The David Project does something completely different. It throws so much at you and you get to see the real Israel. It was extremely important to me to learn about the experiences of Druze, Arabs, Palestinians, Israeli Christians, and more so that I could come back with a deeper understanding of the situation. I’m just so thankful that this program allowed me to do that. Can you tell me about a few moments that you think were significant for the other participants? Sure. A memory that really stands out to me was with one of the guys on the trip who was raised Christian. He had explained to me that he doesn’t practice very much now, but I remember him coming up to me one day after we went to the Church of the Nativity, saying that he had a religious experience there. It was kind of crazy to see. He was moved in a way he hadn’t been before in a place that was so new to him. It reminded me of the feeling I had when I went to the Western Wall for the first time, so I think I understood what he meant. Another thing I found pretty interesting was how quickly one of the participants connected to the people in Israel. She is Ethiopian and speaks Amharic, so she was able to converse with other Ethiopians during different parts of the trip. I think she was somewhat aware of how diverse the country is in that way, but I’m sure actually feeling it herself was pretty special. It was like she was right at home. Can you describe Yad Vashem’s [Israel’s Holocaust memorial museum] impact? One person who I think had a unique experience at Yad Vashem was the Muslim student on our trip. As we were walking through, I remember seeing him appear struck by the area in the museum devoted to North African Jews who suffered in the Holocaust. He became totally enamored with it, likely because he is Libyan. When I caught up with him afterwards, he explained how he never knew about the Libyan Jews who were affected by antisemitism. Even though his religion was different from these Libyans, he felt connected to them. It seemed like in that moment he understood why this country has to exist for the Jewish people, more than he had before. Do you think the trip was effective? Overall I have such a deeper understanding of the country I love so much and I am so proud to have been able to go through this with an awesome group. Originally when I heard about the trip, I was interested to visit a country with such a strong relation to my fellow Ethiopians. I knew of initiatives Israel had completed to bring Ethiopian Jews back, like Operation Moses, but didn’t realize the rationale or sense of belonging these Ethiopians felt towards Israel. When we finally arrived in Israel I felt welcomed in what seemed like foreign territory, and at home. At times, I would feel a sense of belonging enveloped in a piece of the Ethiopian Jews who had come to Israel. Coming from a campus community where it’s hard to find your identity represented, it was refreshing being able to build a cultural connection in Israel. I didn’t just get the chance to learn about Israel, but about my Ethiopian heritage, too. It has been almost two months since I was in Israel and I still have trouble putting the experience into words. Even though I only spent a short ten days in Israel, between the hours of adventures, cultures, and lifestyle that I experienced, I felt as if I had been there for years. Israel has taught me so much more about myself and the people around me than I have experienced in my four short years of college. The David Project and Israel will forever hold a special place in my heart, and I can’t wait to go back. L’Chaim! I’ve never really had to think about the Israeli-Palestinian conflict. I was raised in a Christian home in northern Ohio and even when I got to college, I never really was forced to confront the situation at all. People would mention it in passing or about the things they saw on the news, but I’d nod and smile and pretend to have an opinion if necessary. That’s a really scary way to live life; to be completely honest, it’s an unacceptable way to live life. When I heard about the opportunity to go to Israel with the David Project and see these things for myself, I was a strange mix of excited and scared and confused. Upon my return, I am still all of these things … but in a very, very different way. In addition, I also have hope, which is something I didn’t expect to gain. I saw 40 very type-A crazy campus leaders (many of whom will lead our world one day) in harmony and having difficult discussions that many people twice and three times our age are unable to have out of fear. I learned that the solution to peace is not really a solution at all, but rather a process, similar to the process of the trip itself. This experience for me was transcendent, truly eye-opening and breathtaking. The feelings I felt—I may never be able to explain some of them. Israel holds so much beauty in such a small area. I would love to visit Israel again, hopefully soon, and learn so much more! Wow. Israel. Such an incredible thing, but sometimes hard to put into words. My experience with the David Project was one that will never compare. It allowed me to truly feel in a way that I have never before. Being able to see places I grew up learning about like Jerusalem, Sea of Galilee, and the Mount of Beatitudes gave me a connection that I certainly missed whenever I heard about them. Being immersed in a place that I associated with such hate and fighting only to realize the amount of love that fills its borders made me want to cry for being so narrow. I never understood what Israel actually was, and now that I do, I love it with every ounce of my soul. The trip’s purpose was to expose campus leaders about what it actually is, and I can confidently say it was not only a step in understanding the place, but a step in understanding what’s important as we traverse our paths of life. I can go on and on about the details of what I felt or the technicalities of what is occurring there, but there is really one sentence that sums it up the best for me. Israel is a place to find you. The David Project’s 2016 Israel Uncovered trip was funded in part by a 2016 Jewish Innovation Funds macrogrant. For more information about the Jewish Innovation Funds, visit jewishcincinnati.org/innovation.